It is the goal of the AFP-GLAC to support the professional development of its members. One way AFP-GLAC achieves this goal is by providing financial assistance in the form of scholarships. Scholarships will be awarded until all scholarship funds have been used. Chapter Scholarships are made possible by the generous donations of our members to the AFP-GLAC Chapter fund. Click on the links below for scholarship requirements and the online application. To assist AFP-GLAC members who are between employers or work for smaller organizations, this scholarship will pay for 50% or $30 towards the cost of an AFP-GLAC Development Seminar/Luncheon. The scholarship is available to current AFP-GLAC members and the one year membership requirement is waived for this scholarship. To apply, please complete and submit the scholarship application at least 10 business days before Early Bird Registration ends. Please see the due dates listed below. Click here for to access the Scholarship Application form. 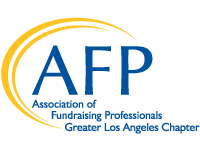 This scholarship covers $100 of the membership fee for new and renewing members to join the AFP Greater Los Angeles Chapter. There are 5 available scholarships per year that are awarded on a first-come, first-serve basis. Applicants must be full-time fundraisers or spend at least fifty percent of their time fundraising. Special circumstances may be considered at the discretion of the Scholarship Committee. Click here to access the Scholarship Application form. There are scholarships available for our annual AFP-GLAC Regional Philanthropy Conference. This is an outstanding learning and networking opportunity. To apply, please complete and submit the scholarship application at by September 27. Click here to access the Scholarship Application form. This application is for current AFP-GLAC members. Please click on the links for Chapter Fund Scholarship Application Rules and Guidelines.